The director, William Beaudine, is apparently a big deal among bad movie aficionados, but I’d never heard of him. 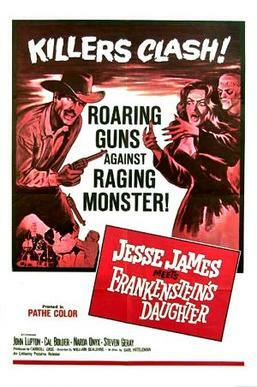 Jesse James Meets Frankenstein’s Daughter was his last film, intended as a double feature with his other Western/Horror mashup, Billy the Kid Versus Dracula (which I haven’t seen but is reportedly slightly better). If you’ve ever seen a bad 1960s horror film, you probably have a good sense of Beaudine’s style—slow pacing, rigid action scenes, and a strange mix of intermittently overwritten and/or boring dialogue. Character’s change their motivations and/or fall in love instantly. Everything looks cheap and we can only wonder why Mystery Science Theater 3,000 never took it on. Oh, and nothing is remotely scary. It’s hard to tell when the film takes place, but it’s at least after James’s disastrous 1876 Northfield Raid (here referred to repeatedly as “Northridge”) and probably after James’s 1882 murder by Robert Ford, as one observer seems surprised James is alive. The eponymous “daughter” is actually Victor Frankenstein’s granddaughter Maria (Narda Onyx, in her last role), who is committed to continuing the family’s experiments animating the dead with electricity. Authorities in Vienna discovered her nefarious plans, so she and her reluctant brother Rudolph (Steven Geray, in nearly his last role—I’m sensing a trend here) fled to the American West. There, they experiment in obscurity with a ready supply of warm bodies. I’m admittedly much more familiar with Mary Shelley’s book than the vast corpus of Frankenstein movies, so there may be some kind of continuity here, but I doubt it. The action begins in media res, with villagers fleeing the Frankensteins after the neighborhood body count starts rising. One such family runs into James (John Lupton, not to be confused with the former Assistant Director of The Papers of Abraham Lincoln) and his partner Hank Tracy (Cal Bolder, whose career ended 2 years later), a gentle brute who James has taken under his wing. Never shy of over-explaining things, the film gets James involved in a caper that’s equal parts confusing and boring, but the fallout is Hank gets shot and needs a doctor. James can’t go to a legitimate doctor because he’s a wanted man, so the family’s fiery daughter Juanita (Estelita Rodriguez in, you guessed it, her last role) recommends he go to the Frankensteins. She even goes with him, despite having spent the film’s first scene telling her parents she’d never come back to their village. Maria needs a strapping subject for her experiments and Hank fits the bill, so she welcomes the two outlaws and whisks Hank away to her lab. Putting on what appears to be a painted MP helmet with metal poles glued to the sides, she transplants a dead brain into Hank’s head and turns him into a zombie. Maria immediately orders Hank to kill Rudolph—who’s been secretly sabotaging her experiments—and tries to seduce James. Unfortunately for Maria, James has already sparked up with Juanita (breaking Han Solo and Princess Leia’s record for fastest transition from light flirting to complete devotion) and spurns Maria’s advances, sending her into a rage. She commands Hank to kill James but Hank’s conscience gets the better of him and he kills Maria instead. Tragically, Hank can’t overcome his programming and starts strangling James too but Juanita barges in just in time to shoot Hank dead (or re-dead). She and James briefly consider shacking up but decide to part ways. Roll credits. Maria Frankenstein in her nifty hat. There’s all kinds of boring ancillary business (read: “filler”) I won’t get into here, but you get the picture. The plot is cobbled together from Western and Horror cliches but could anyone expect much more given the film’s title? I can imagine a whole other article on how this movie engages with Frankenstein‘s legacy, but this is a Civil War blog, so let’s focus on James. Jesse James belongs to a group of historical figures who are almost unknowable due to a dearth of primary sources but abundance of myth. In James’s case, this was entirely by design. Originally a pro-Confederate guerilla under one of the war’s most vicious commanders, Bloody Bill Anderson, James turned to bank and train robbing after the war. These activities became highly politicized, mostly due to his alliance with Kansas City Times Editor John Newman Edwards, who constructed a romanticized image of James as a crusading defender of southern rights. James’s ensuing fame fractured his image in various directions. What exactly was he? A criminal mastermind? A white supremacist vigilante akin to the Klan? or a Robin Hood figure fighting carpetbaggers? Edwards, and James himself, adopted the latter image and Jesse James Meets Frankenstein’s Daughter mostly adheres to it. There isn’t much history in the film, but it gets a few little details right—or at least close to right. The the half-correct reference to Northfield suggests the scriptwriter, Carl K. Hittleman, thought he should at least explain why James was no longer part of a gang. James also correctly uses the alias “Mr. Howard” a few times, showing a passing knowledge of at least the folk song “Jesse James.” There’s even a quick reference to Jesse’s brother Frank, who the script claims is hiding out in Kentucky, posing as a preacher. James himself is an outlaw with a heart of gold—a crack shot who everyone regards with fear and awe. His only motivation is to stay ahead of the law with no mention of his politics or why he became an outlaw in the first place. In other words, the hero of Jesse James Meets Frankenstein’s Daughter is typical of the Civil War centennial’s view of the Confederacy and its supporters. James’s star has fallen in the past half-century, but he enjoyed a pretty big renaissance in the mid-20th Century. James appeared in a host of other movies (including 1950’s The Return of Jesse James, also written by Hittleman) and various other media (like episodes of the classic Spiderman cartoon and The Brady Bunch, both of which I’ll review here at some point). All these pieces of culture deal with James different, but almost none reference his politics. Just as the centennial fashioned a Confederacy devoid of concrete political goals (besides the vague “states’ rights”) and focused primarily on the honor and mettle of the Confederate soldier, so too did James become at worst a heartless criminal and at best an honorable outlaw. In this case, the honorable thing is defeating Frankenstein’s granddaughter. You know, Civil War stuff. My favorite thing about this movie may be how quickly James and Juanita fall for each other. They meet, she recommends they go to Frankenstein’s ranch, the next morning Native Americans attack, James dispatches them in short order, and the two immediately begin making out. Of course, no one mentions James’s wife and kids, presumably still back in Missouri mourning his apparent death. I guess his sense of honor only goes so far. It’s also worth noting that, just as the film detaches James from his politics, it also uproots him geographically. There’s never any mention of where this takes place, but it’s clearly somewhere in the American southwest. “Northridge” is referenced without context and no mention is made of Missouri. This helps makes James a political blank slate, since his politics were so deeply tied to his home state. There is one explicit reference to James’s legendary Robin Hood status. When a marshal pursuing him encounters Juanita’s family, he finds some coins and says, “I hear Jesse James steals from the rich and gives to the poor.” Then he throws the coins back at the family, leaving it to the viewer to decide if the reference is true. After Hank becomes a zombie, Maria renames him Igor, presumably for maximum camp. Does it mention slavery: Other than Maria turning Hank into her unwilling servant, not at all. We could give the movie more credit than it deserves by saying it’s a parable about James overcoming his pro-Confederate and pro-slavery past, embodied by Maria Frankenstein, but even I won’t go that far.